Your first glance of our building will likely be from Skyliners Road as you come west from Bend. You'll turn left on Skyline Ranch Road and enter our driveway from the west, winding around the back of the building to parking areas on the east side. We wanted people to have a chance to decompress as they park in the trees and walk on paths to our front door. As you approach, you are greeted by a juniper slab bench inscribed with "All Are Welcome Here." A sheltered entry on the southeast side of the building creates a welcoming sun pocket in the winter and a cool, shady place to rest in the heat of summer. The long bench was milled from one of the old juniper trees that we had to cut down. A rock wall, built with welded tuff—a volcanic rock quarried less than a mile away—draws you into the building. This is just one of the ways the building is firmly connected to the earth. Enter through double doors and a low vestibule, moving into a wide entry hall with a higher ceiling. Just ahead on your left is the welcome area in a small alcove. The welcome tables are designed for greeting visitors. One is high to make it easier to write and make nametags, and another, nesting into the first, is low and within easy reach for people confined to wheelchairs and for children. The Gathering Hall is our hub. It opens up to the sanctuary behind the great doors so we can expand out from the sanctuary or into the sanctuary depending on the crowd and activity. The doors to the terrace open wide. Protected from wind and facing south, they can be open almost anytime during the year. The long farm tables attract all generations after the service for coffee and conversation, crafts, snacks, after-service lunches, potlucks, and art projects. The north side of the Gathering Hall opens into the Linus Pauling Hall & Gallery and to a pass-through into the kitchen. Our sanctuary embodies our vision and aspirations. 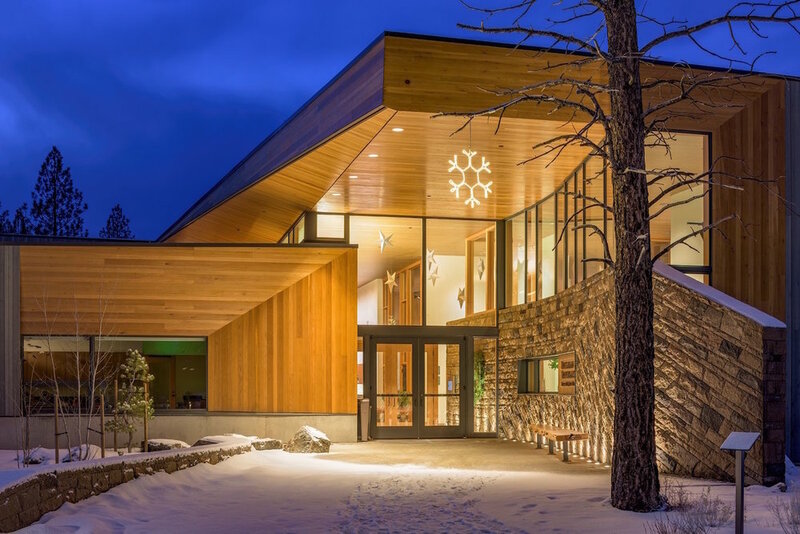 Its connection to our land is strong, with the north windows looking out onto the sacred grove, and south windows providing a vista through the trees to sagebrush beyond. The large mass wall on the south helps moderate temperature changes and is pierced with angled openings to let light in while blocking direct sun in the winter. The wall is set back from the windows, providing space for a ramp to the stage. The great carved doors at the back of the sanctuary allow for expansion between the gathering and sanctuary spaces. Form and function are united in our building, and especially in the sanctuary. 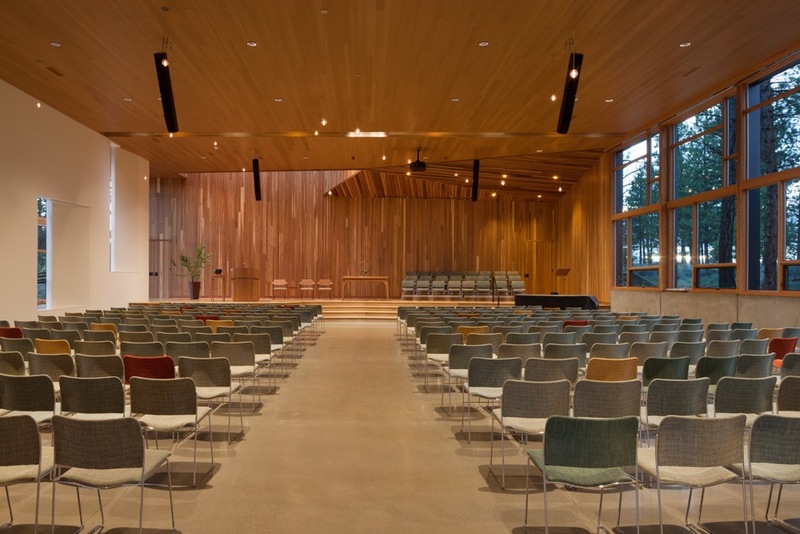 The doors are part of an acoustic system that includes the angles in the openings in the wall, the wood ceiling, the spacing between the rocks on the back wall, the openings in the mass wall, and the angles of the cedar ceiling on the stage. The flat floor provides flexibility for services and other uses. The sanctuary is designed to seat 216 comfortably with another 30 people on stage. 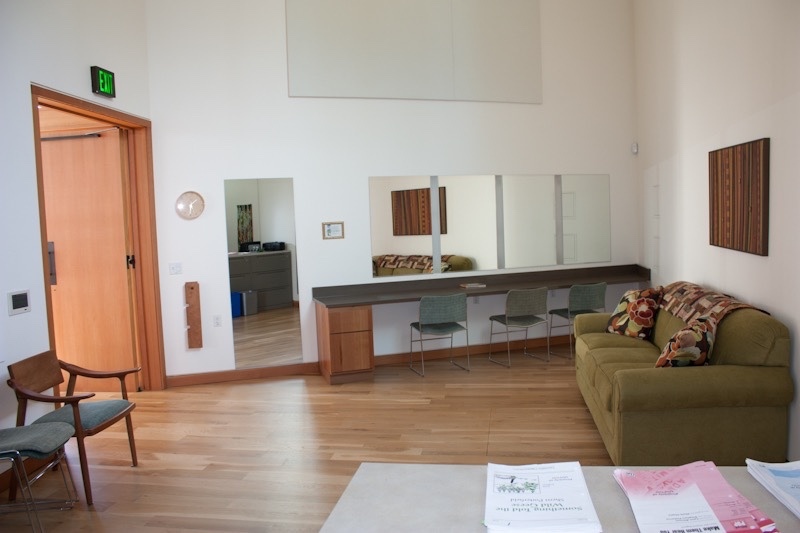 Intended as a multipurpose room, the Linus Pauling Hall and Gallery is a well-positioned, versatile space. It looks out on the sacred Ponderosa grove that was protected through design and construction phases and is home to deer and nesting birds. With the only wood floor in the building except for the stage and Green Room, it is ideal for weekly yoga and Qigong classes. Film screenings are held here, as well as larger meetings and discussion groups, rotating art exhibits, and classes. It serves well as the table setup area for potlucks or catered events. In the heart of our building, the Founders’ Fireside Room is a warm, quiet retreat for reading or conversations. Small groups meet around the table in the nook to the left, where light floods in from above. The Sunday meditation group gathers on the bench seat with cushions around the fireplace. When privacy isn't needed, the wooden doors fold back into the walls, opening the space wide to the entry and gathering halls. Parents can bring restless children here and watch and listen to the service. Knowing that we intended to have concerts and other events in our sanctuary, we included a backstage green room in our plan. It offers space for us and others to prepare for performances. It is the office and workspace of our music director and storage space for our growing inventory of instruments. With its own bathroom and ample mirrors, it has proved to be a good area to prepare for weddings. Small group discussions also take place here. Our kitchen functions well for Sunday coffee, potlucks, family pizza nights, Sunday soup and salad lunches, as well as outside catering. It has access on three sides to different areas: a pass-through window to the Gathering Hall, a door to Linus Pauling Hall, and two doors to the service corridor. When we toured other churches prior to the design phase, the number one appliance they recommended was a commercial dishwasher. We are grateful we listened and designed the whole kitchen to meet commercial standards. Intended for board and committee meetings, classes, and overflow workspace, this is a frequently used room. The high north and west windows provide a connection with the trees, while still giving privacy to those inside. The conference table seats 12 comfortably. The beautiful work of a son of a congregant, the table was donated to the Fellowship and provides a sense of grounding to those who gather around it. It has A/V connections in the center allowing for computer plug-ins, presentations, and video conferencing. North of the entry hall, the two bronze cranes, sculpted by Danae Bennett Miller, are our first permanent work of art. The cranes symbolize the roots and wings in "Spirit of Life," the chalice lighting song we sing each Sunday. Roots & Wings was the theme for our capital campaign for the building. The artist said that as she created the design—molding wax, preparing the pieces for casting, and assembling the cranes—she felt a profound spirit of life as she worked. The Religious Exploration entrance is on the left side of the Entry Hall, across from the crane sculptures. Prayer flags welcome the children. Light is borrowed from high windows on the north and south. The children gather in the Commons before going to their classrooms. The library for the children and youth is in this space. A wall of cabinets painted with whiteboard paint invites children to share their thoughts and drawings. A small kitchen provides facilities for preparing snacks. There's an accessible bathroom here for the children. A Ping-Pong table provides space for large projects and invites children and adults to play together after the service. This is a fun space with a bright checkered floor, climbing steps for little ones, a colorful round rug for story-telling, lots of books, a blackboard wall for drawing, and plenty of space for hanging artwork. A tall window by the steps looks east. Light is borrowed from the Starr King Corner to the south. 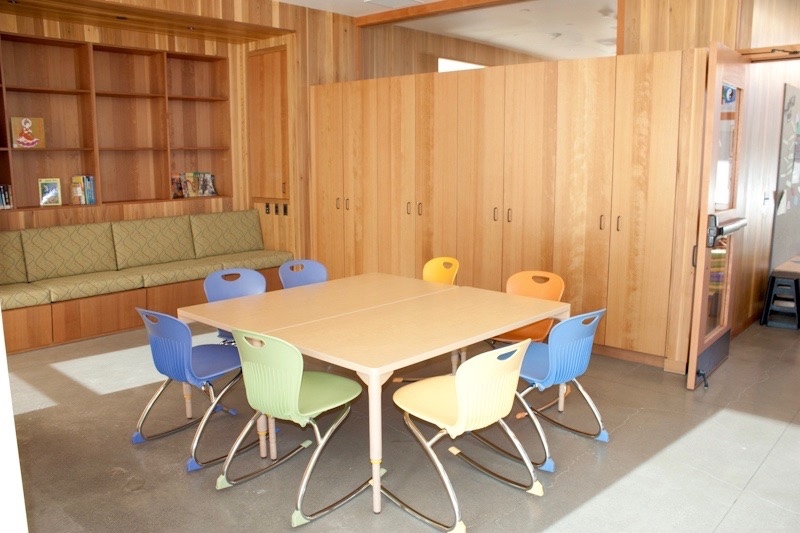 This area is set up for newborns to age four, and includes a nursing chair and crib. 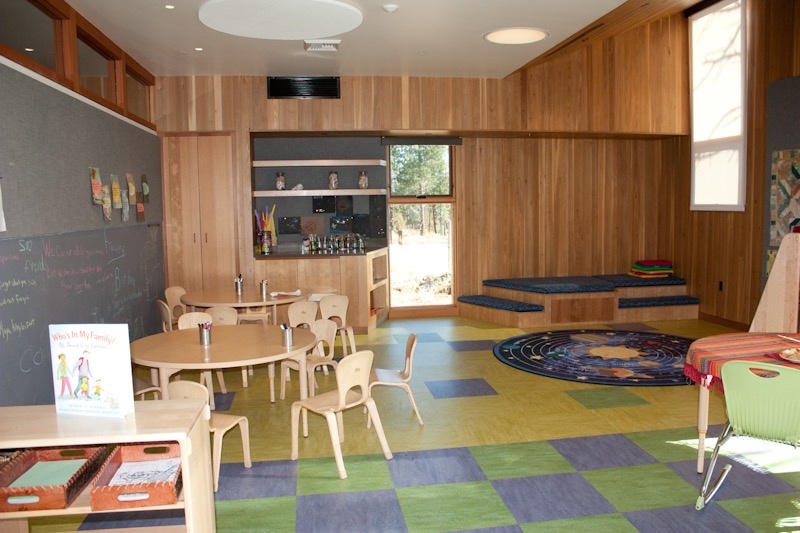 A bright, sunny space, this is home for kindergarten to 2nd grades. Windows face east and south, with a door opening to the terrace and the play area just below. The children plant seeds just outside the window. Steps and a raised area are perfect for reading and sharing. The floor has a life-size checkerboard and sinks are sized both for young ones and adults. Home to 3rd to 5th graders, this opens to the terrace and play area behind the mass wall, which helps moderate temperatures in this area. 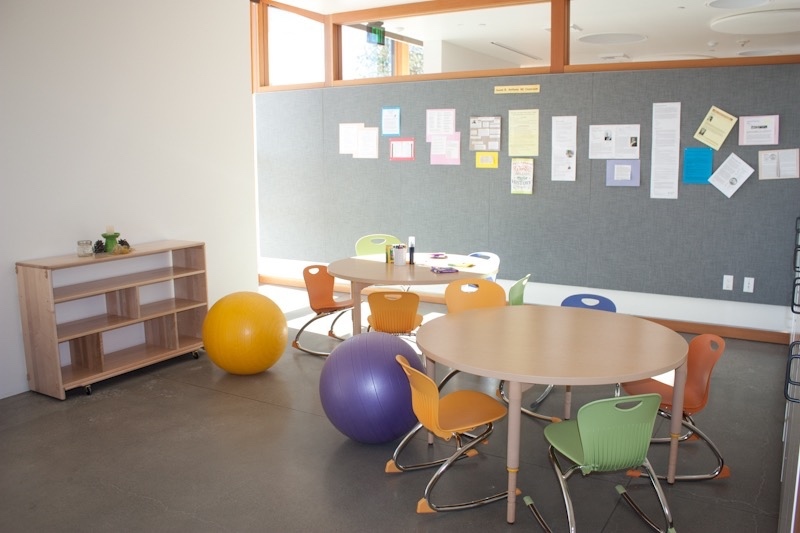 The brightly colored rocking chairs and balls offer flexible seating for our active children. The display board is a place for sharing creative work and ideas. Our 6th to 8th graders meet in this space. It is also a favorite place for small meetings during the week and is intended to be home to our future youth group. It is set up with an outside entrance specifically for meetings of 12-step or other programs that don't want or need access to the whole building. With the help of a Chalice Lighters grant, we created a natural play area for children to inspire creativity and imagination, encourage discovery and exploration, and foster interaction and cooperation. It is located on the south side of our building, in a sun pocket below the RE classrooms and terrace, just above a swale and old snag with nesting woodpeckers. A tunnel of willow branches delights little ones. We used rocks, stumps, and logs from our land to provide climbing and balancing features. There's a sand area for playing and building. An amandinda and marimba designed for outdoor use give children an opportunity to explore music and sound. A pollinator garden is located closer to the classrooms. The play area will develop in response to the children who use it, and is a launching point for a loop trail on the land — which will eventually be a nature trail.